Inspector Jacques Clouseau investigates the murder of Mr. Benjamin Ballon's driver at a country estate. Empire: It was never supposed to be about that cartoon panther. In the first movie, the Pink Panther was the name of the diamond that gentleman cat burglars Robert Wagner and David Niven were desperate to get their mitts on. It wasn't until director Blake Edwards commissioned noted animation team DePatie-Freling to come up with a title design that the cartoon hero (aided and abetted by Henry Mancini's classic sax-led theme) took centre stage. The success of a kids' TV cartoon series in 1966 led to all subsequent Clouseau movies being branded by the Pink Panther, a fact that never made sense outside of marketing circles. (Think about it—Roberto Benigni starred as Clouseau's offspring in 1993's Son Of The Pink Panther—son of a diamond?). But in 1964, both Edwards and his star Peter Sellers weren't too interested in the cartoon, here they were in love with the buffoon, providing Sellers with the best outing for what was to become the defining character of his erratic, yet brilliant, career. Check it out for the brilliantly sustained seduction scene in Clouseau's apartment (complete with "beumb" and Kato-interruptus); admire it for the wonderfully ridiculous watch synchronising sequence with Sellers and Graham Stark; and witness the wit and comic elegance of the drawing room finale where Clouseau attempts to flush the killer into the open only to completely lose the plot when he finds out they all did it. Oh, and don't forget to look twice at the nudist camp attendant, billed as one "Turk Thrust" (in actuality film director Bryan Forbes). 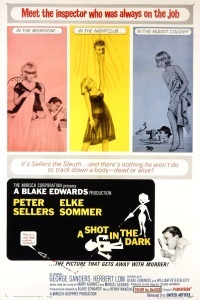 Telegraph: Behind-the-scenes all was not well during filming and Edwards later revealed that Sellers "became a monster. He just got bored with the part and became angry, sullen and unprofessional". The Polish poster is surprisingly non-bonkers. Wow, haven't seen this since the seventies. It was hilarious when I was ten, I'm a little afraid at how well it holds up. Screenplay by William Peter Blatty?! That, um, is unexpected.